The season of Lent is starting with Ash Wednesday on 6 March at 6 pm. As for our pulpit sermons, apart from observing the First Sunday of Lent (10 Mar) and Palm Sunday (14 April), in preparation for the Celebration of Hope, we will be exploring some questions of life under the theme "Faith & Life.". We have scheduled a few guest speakers to preach alongside our pastors. It will be a good opportunity to invite your unchurched friends to explore the Christian faith. We will let you know at least a week before, what the topics are and who the speakers will be. During Lent, we are also starting noontime daily prayers from 12.30 pm to 1.00 pm. On Wednesday, it will be a Holy Communion Service which ends at about 1.30 pm. On Friday, the intercessory group, City@Prayer will be leading the noontime prayer and participants should expect a more active prayer engagement. We will be offering daily prayer for our Church, Society and Nations. We started our evening Alpha Course this week with the Introductory dinner on Wednesday. More than a hundred guests turned up, not counting our own members. We appreciate prayer for this run as Christians lovingly accompany seekers in their search for truth. This evening course is not to be confused with Alpha Everywhere which is starting later in March-April. We will be hosting lunchtime groups on our grounds and if you will like to help, please contact Andrew Ho @ 63376104 ext 132 or email andrewho@cathedral.org.sg. Members are also encouraged to host Alpha in their home or office. Do let him know if you are interested to help in some way. Meanwhile, do be "praying without ceasing" (1 Thess 5:17) in this period of run-up to the Celebration of Hope. In praying, we discern the purposes of the Lord and His will and plans for our lives and that of the nation. The monthly regional prayer is one meeting not to be missed if you want to stay spiritually tuned in. We also have various prayer gatherings and you are encouraged to participate. Being the season of Lent, I should also encourage you to use our daily Bible Lectionary readings in our Cathedral App. This can be on top of whatever devotional resource you are currently using. The lectionary readings can help you to stay close to the emphases of the church calendar with audio facilities for those who need it. Another event to note is the Andrew Initiative Training on Sat 2nd Mar at 9 am. It will help you to better engage with COH rallies, show you how to invite friends and what you can do if they are interested to respond to the Gospel call. If you are not free on this morning, the same training is also offered elsewhere. I know this is nagging, but we need many more of you to volunteer to serve at the English/Filipino rally. This Sunday morning rally will be a popular one, not just for Filipinos but just about anybody who can understand English! We can imagine that many foreigners will also be coming, including those from Myanmar, Indonesia, Thailand and so on. 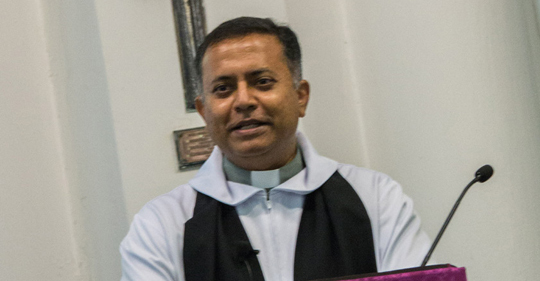 Canon J John will be speaking. A few household celebrities will also be performing and sharing their testimonies i.e. Barbie Almalbis, MadRush and Coro Cantabile. This is an opportunity on a Sunday morning to “go in peace to love and serve the Lord" in a different way. We sometimes forget but the term “Service” (as in Sunday Services) originally connotes the idea of worshippers coming to serve on Sunday and to be sent out to serve Christ in the world. The idea of "being served” is a mistaken notion. Indeed, with the coming Season of Lent, may we be reminded again of our Lord who serves us with a towel and basin (John 13:12-15). I had a wonderful time celebrating Chinese New Year back in my hometown Petaling Jaya, in the very house which I grew up in as a child. We reconnected with family members and relatives over traditional dishes. The burning of fire-crackers was permitted for a limited period of time and we relived some of our childhood experiences. Indeed, we experienced the same smells, tastes, sounds and sights of CNY that we grew up with. Connections with one's past are important and I am reminded again of the grace of God which has carried us through all these years. 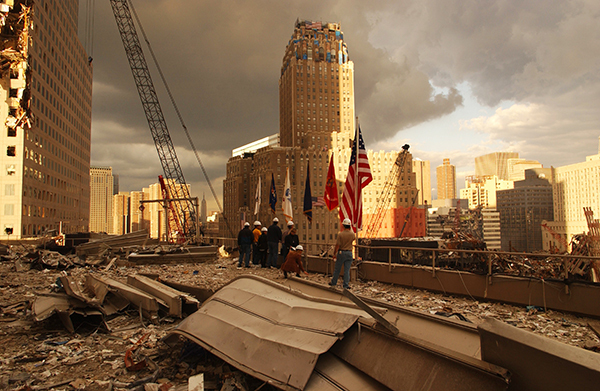 On behalf of PCC and the team working behind the Bells Project, we want to thank all who have donated to the project. PCC has made a decision to purchase another four bells, plus an additional one for training purposes. In terms of names, as St Paul is already part of the original eight, this also means that we can now add St Matthias (Acts 1:26). 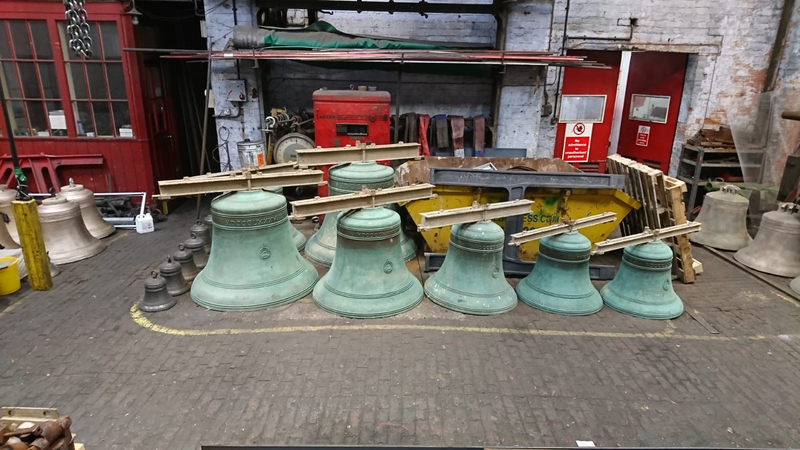 The bells have arrived safely in UK since early January (pictured above) and are now being repaired and refurbished. We are hoping that they can be back this year and be a part of our contribution to the bicentennial celebrations and Diocese's Year of Proclamation. The plans to refurbish and restore the Nave (i.e. walls, windows) are underway and at the coming AGM, we will give more details and the cost estimates. The Cathedral will be playing a role to host a special Lessons and Carols Service in December to celebrate the Bicentennial Year with the rest of the nation. We hope some parts can be repaired in time for that. Can SAC raise 1000 ushers and 200 counsellors to serve in the English/Filipino rally on Sunday, 19 May? I believe we can but it will take many small groups or families to encourage each other to participate. In a sense, we are spending that Sunday morning to worship the Lord in a different way. On that weekend, we will be running only two Services, 8 am and 11.15 am. Please sign up today. Your early response is needed and will help us to ascertain if we need to now ask other churches to help. But we'd like to believe that the Cathedral community can rise up to this unique call! In recent weeks, the Cafe has begun to serve some drinks in porcelain cups during the weekdays. This is one small step in seeking to be more responsible vis-a-vis our environment. Much more needs to be done in SAC in this area and at the right time, we will continue to take further steps. And did you know that you can download a digital copy of our weekly bulletin? As more of you do this, we can reduce the copies being printed. 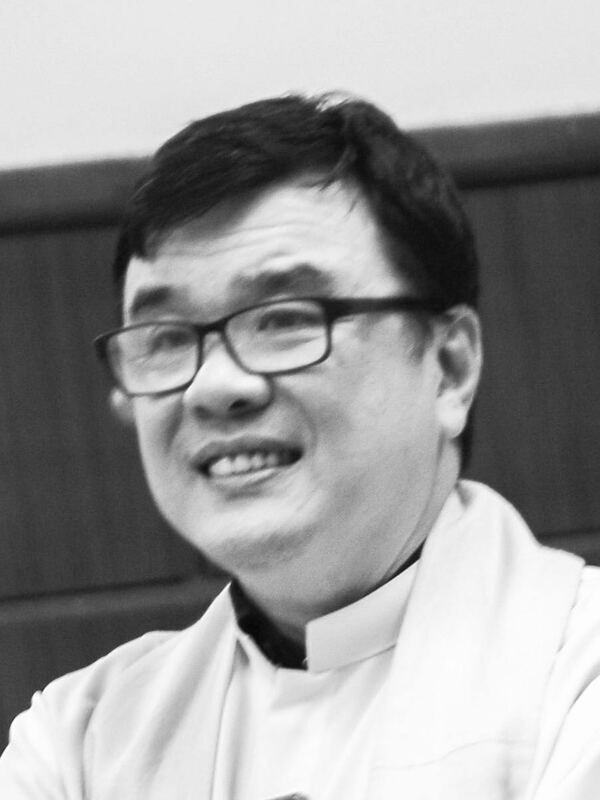 Visit cathedral.org.sg/bulletin to download our weekly bulletin. In the mid-80’s, I used to join short-term mission trips to the Riau Islands. I have this vivid memory of seeing this teenage boy locked up in a cage like an animal. It was a very disturbing sight. Of course, in developed societies today, we are now a lot more aware of those with special needs like autism. Hence, we will not treat sufferers of this condition in that manner. Our Diocese is deeply involved with this via the St Andrew's Autism Centre (SAAC) which operates a special school for children and youths with autism from 7 to 18 years old. It is challenging but rewarding work as we see families being helped. Along with that, SAAC also has facilities for a Day Activity Centre (DAC) for adults aged 19 and beyond. This work now moves to another level with the completion of St Andrew’s Adult Home (SAAH) at Sengkang at the end of 2018. It is a home specially designed and built to meet the needs of adults with autism. It has the capacity to house 200 residents, and will also have a co-located Day Activity Centre (DAC) with a capacity for 50 adult clients. This is a new phase of ministry. Each Home or Centre under Singapore Anglican Community Services or St Andrew’s Mission Hospital is supported by an anchor parish. The Cathedral is the anchor parish for this new St Andrew's Adult Home (SAAH). This means that we will be supporting the Chaplaincy work which provides pastoral care for clients and the caregivers. Wilson Sie is the chaplain there. Where possible, members can be encouraged to help and show the love of Christ to both workers and clients in this Home. Most of the nurses and health-care assistants in homes like these come from surrounding countries. Recently 28 new staff flew in from Mizoram (Northeast India) to begin a 2-year renewable stint. They are mostly in their 20's and early 30's and all are Christians. We hosted a tea for them and introduced them to the Cathedral (see photo). Young and eager, they are a great bunch and beaming with so much potential. We are beginning to connect with them and are seeking ways to help make their stay and work here more comfortable and meaningful. By the way, weekly on our grounds, we have groups of workers from Mizoram who gather for social and worship purposes. Our senior staff, Mrs Patricia Aw heads our community services ministries and will be the liaison person for this. We had a wonderful and inspiring regional prayer meeting on the last Friday of January. Watch out for the next one on Friday evening of 22nd February. There are many meetings and events in the Cathedral but for me, prayer meetings are special. These meetings are not merely a presentation of a list of requests to God. We don’t often say this very clearly, but the Lord Jesus is the Shepherd of this Church (Eph 4:15). The local church is a spiritual family and entity. We are a people of His presence. I co-taught the book of Revelation last year and through the letters of the seven churches, we were reminded again of the Lord Jesus’ presence and His love for each local church. This truth, more than anything, governs how I have served in every parish and how I see my role as Vicar. We live in an age where we are enamoured by the CEO and the power of leadership. But the Church is different. When the human influence is exercised without reference to the Word, His Spirit and koinonia acceptability to His Body, something is tragically lost. And over time, the work can be seen to be "wood, hay and stubble" (1 Cor 2:11-13). This is an insight which I found in greater clarity when I was serving in my previous parish. We were facing spiritual stagnation and the parish was struggling. I became acquainted with one of the leaders of Youth With A Mission (YWAM), who later became a very close spiritual friend. I was quite curious about the YWAM leadership approach to ministry and their deep emphasis on prayer and worship. Decisions made were collegial and often through prayer and seeking. This leader helped us to focus on the spiritual life of the parish, and our prayer and worship life took a positive turn. We learned to be a people of His presence. We learned to "give the church back to Him." My years of working in the Alpha Course ministry also exposed me to the spiritual culture and values in Holy Trinity Brompton. How can one local church exert so much influence globally? There I caught a vision of what it meant to be a church measured not just by attendance but influence. I saw a rich prayer and worship life and a leadership culture which aims at people becoming authentic followers of the Lord of the Church. Worshipping and praying sharpens the clarity of what God is doing in our midst (Acts 13:2,3). It keeps us from an activism which is devoid of His presence. Prayer, worship and mission can never be separated. They are not separate events or activities, but a singular expression of a people who know who the Lord is and relate to each other as such. Church prayer meetings also reflect home and family. It is one meeting which separates family from guests and indeed, the latter are very low in numbers, compared to our public weekend Services. We come “home" and we do what a church family should do. It has a different intensity in worship and prayer compared to your public Weekend Services. There are some who are affected or stumbled by the forms of worship or prayer in our prayer meeting. I will encourage one to get past that and get into the essence of these combined gatherings. There will be noise. There will be silence. Old and new. It does not matter if we are family and share a common vision that goes beyond forms. Chinese New Year is round the corner. As families celebrate, it is the ontological and unchangeable family ties that gives meaning to a family gathering. This goes deeper than external forms and activities. It is just being family. Likewise, the church family experiences this when they assemble before the heavenly Father. I don’t think I can share all this at one go. I know all this sounds a bit mystical. Understanding it will need some experience as well. This is a journey I encourage you to discover as well - together - and I pray you will find it here.